re.mix \re-miks\ vb re.mixed; re.mix.ing; re.mix.es: to recombine existing elements creating a new or modified result. Bless me. Be with me. Watch over and protect me. Forgive me. Listen to the way you pray, and to the prayers of those around you, and you'll hear these four tried and true phrases often - familiar words we've probably been saying over and over to god since we first learned how to pray. Yet, while these prayers are part of the Biblical journey, the fact that they dominate our conversations with God can indicate a me-centred faith that is distant from the New Testament adventure we are called to in Christ. ReMixed prayers embrace these four concepts, while moving towards a healthier, God-centred prayer language that saturates our thoughts and words with the phrases, "Let Me Bless You," "Live Through Me," and "No Matter What, Use Me." A subtle shift based on radical truth. Potent prayers for a full life. Message 1: Who's Blessing Whom? 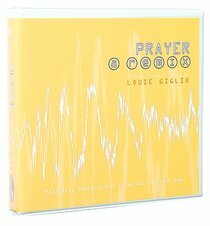 About "Prayer - a Remix (3 Messages On Cd)"